And we never tire of hearing the tales of “Mt. Ida.” My aunts remembered it in its “heyday,” as they said, and never seemed to mind our questions and eager curiosity. 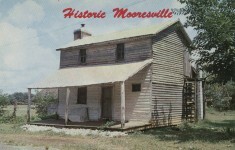 My grandfather’s sister, Aunt Hannah, lived there. She married a widower with one son, who was only four years younger than herself. 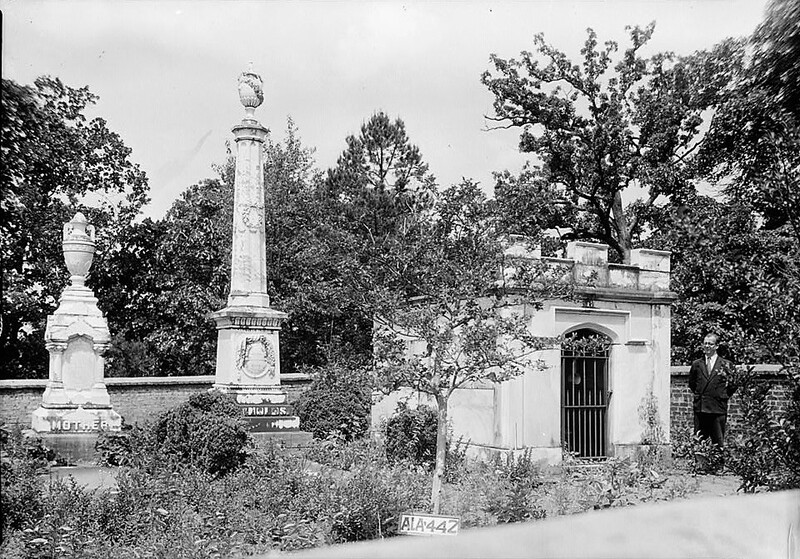 Her husband, Walker Reynolds, built “Mt. 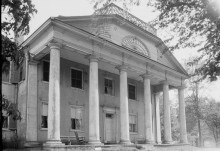 Ida”, adding four rooms and a columned porch after his second marriage. “Mt. Ida” is located on a sloping hill, facing a circle of blue mountains. A boxwood hedge borders a wide brick walk, which leads to the house, now nearly hidden by great magnolias. In the yard are many of the old shrubs—cherry laurel and English cherry grown into trees, the ground underneath carpeted in trailing myrtle. Cedars shade the porch and at one end is a rose growing in a tangled mass, the trellis long since gone. Mr. Reynolds brought a landscape gardener from, Georgia to lay off the yards and surroundings. 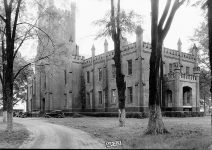 Around the yard is a sandstone wall to the ground level, and once there was a fence with brick pillars, topped with marble squares. 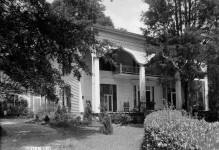 Cape Jessamine bushes grew between the front pillars, and a Marchelniel rose on the trellis at the end of the veranda. 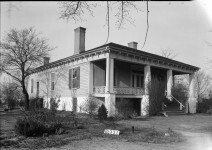 In one corner of the yard was a summer house, vine covered, where the young ladies could entertain their beaux, When the family and guests gathered on the long front gallery in the “evening”, dressed in their cool muslins, branded peaches” were passed as an appetizer, before supper. 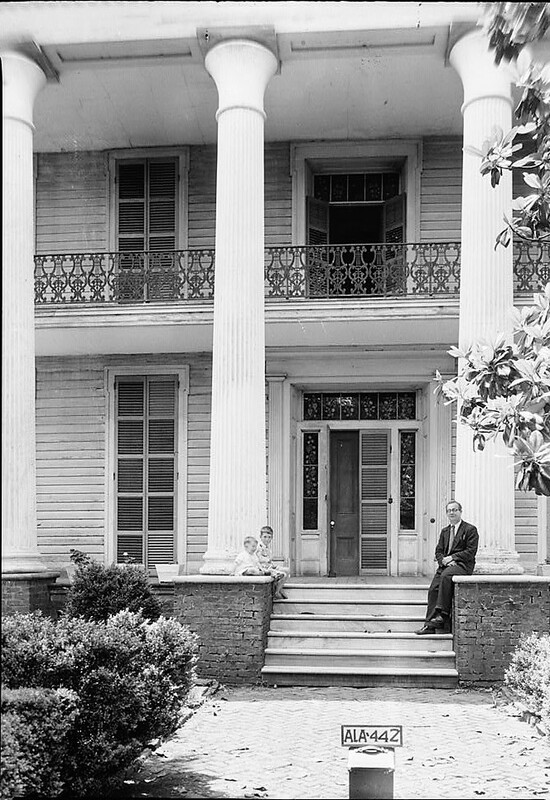 All the romance, glamour and loveliness of the Old South must have been embodied there, for a brief time, in that happy family. Marble steps lead from the wide brick walk, up to the gallery which runs the length of the front and is supported by six fluted columns, made of cement and painted white. 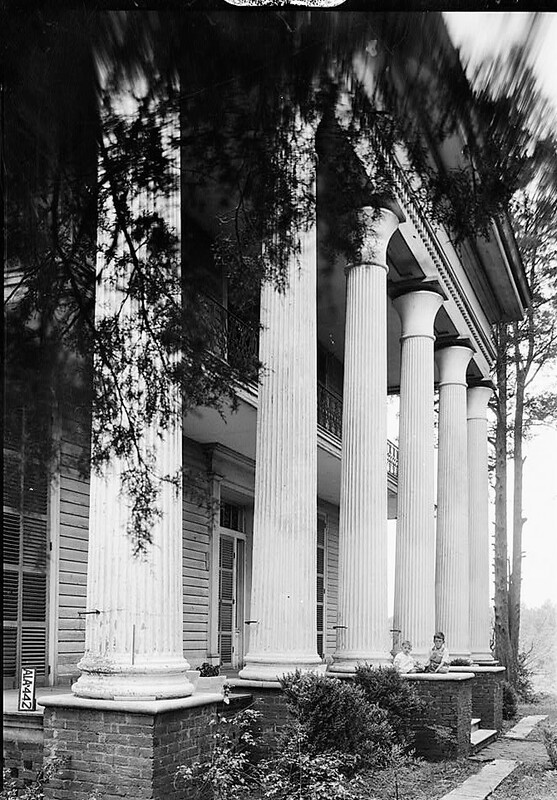 On the inner side of each column is an iron rail to provide a footrest. 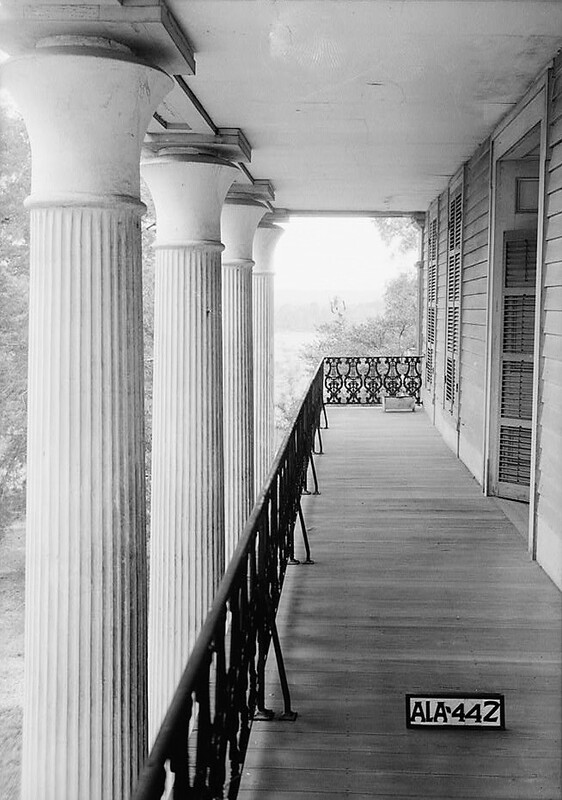 The second-floor balcony is almost as long as the lower porch, with an iron railing in the shape of lyres. The side lights and transom of both upper and lower front doors are of amethyst glass etched in a design of grapes and grape leaves. This glass was imported and only two of the panes have been broken, There are fourteen rooms in the house, and three stairways. 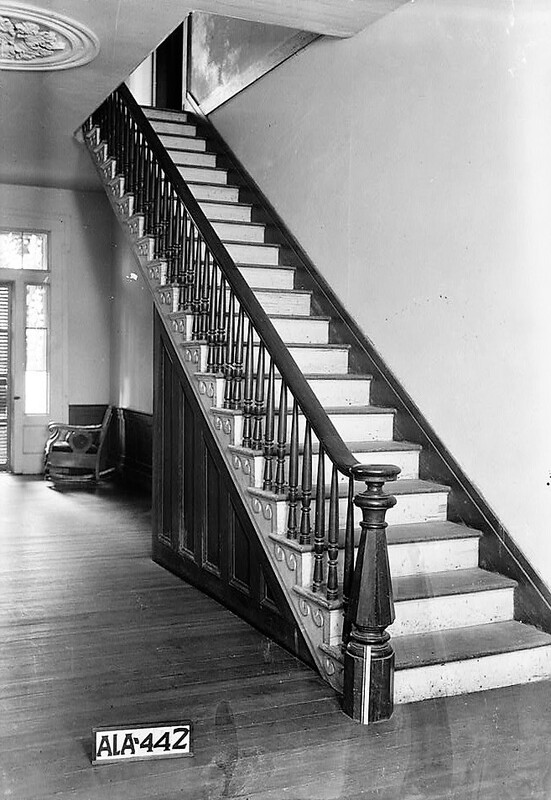 The front stair rises from the rear of the hall, and facing the front door is a niche for statuary. The walls now are a dull tan, but once they were papered in panels depicting the “Nuses”. At the right as you enter, are the double parlors, paneled in maple, with great double doors between. 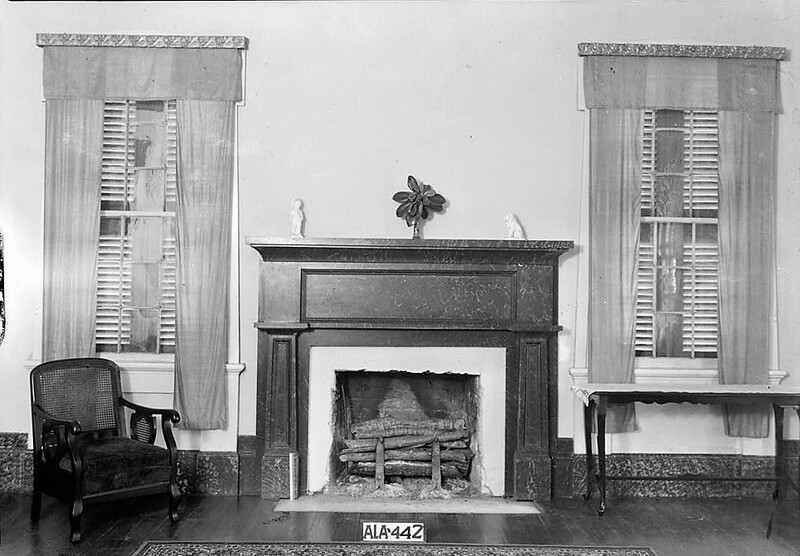 Gilt cornices of elaborate design are still over the windows, mute reminders of the past when the front parlor was furnished as a “duplicate of the Blue Room in the White House, with its blue and gilt trimmings at the windows, blue Axminister carpet in one piece, the eight light chandelier hanging from the twelve foot ceiling center, with its white globes and prismatic glass pendants that reflected the colors of the rainbow; and in the space between the two front windows stood the handsome Pier glass mirror reaching from the floor to the ceiling, resting on its maple pedestal. The two sofas and chairs were trimmed in gilt and upholstered in blue,” so said the last member of the family-a man of 84 (Cousin Mallory Reynolds). The addition to Mt. 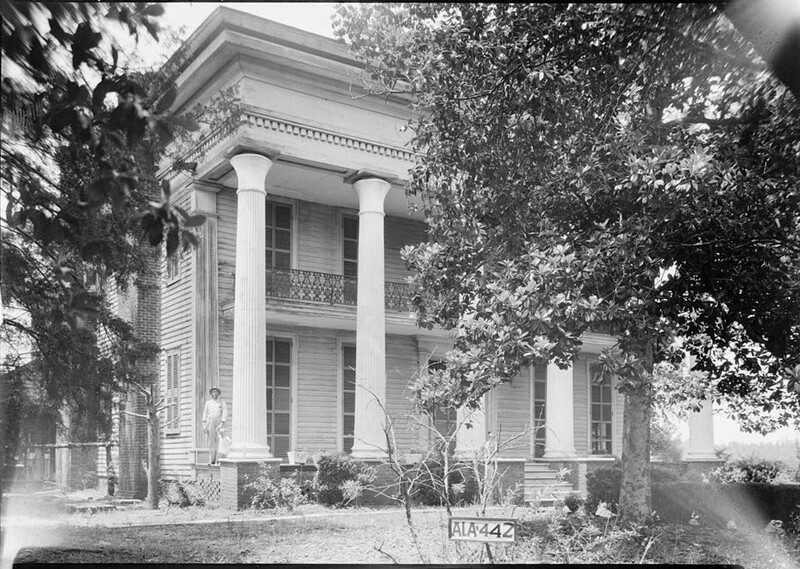 Ida was completed in 1859, and Aunt Hannah and Uncle Walker went to New York in that year to buy the furniture described by Cousin Mallory. In the back parlor was a rosewood set elaborately craved in fruit and flowers, and upholstered in red brocade, for in one of the arm chairs Aunt Hannah sat to have her portrait painted. On the walls is the original wall paper, a grey background with scrolls of gilt. Across the hall were the library and dining room with Aunt Hannah’s room beyond. 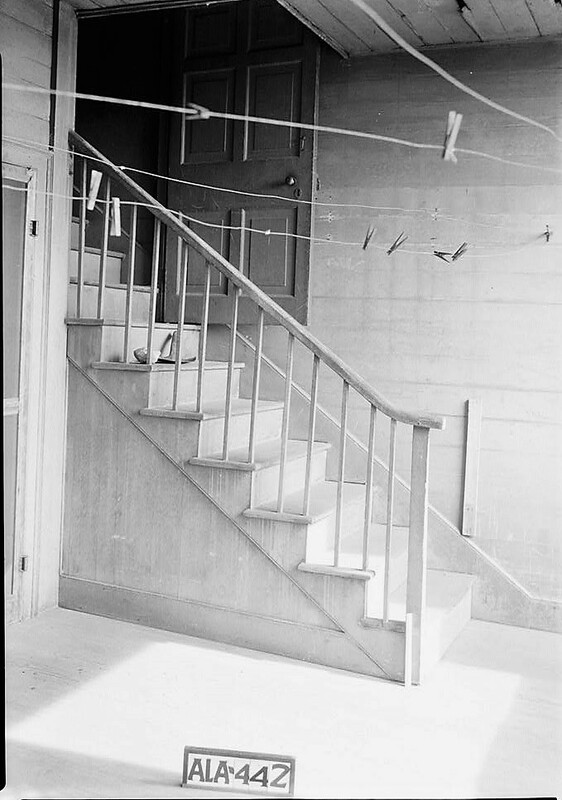 A side door leads to a porch which in turn leads to a covered passage and into the kitchen, long since fallen to decay. In the backyard is the large smoke house, so tall that the meat hung on tiered rafters. As many as two hundred hogs a year were killed in the old days to supply the plantation. 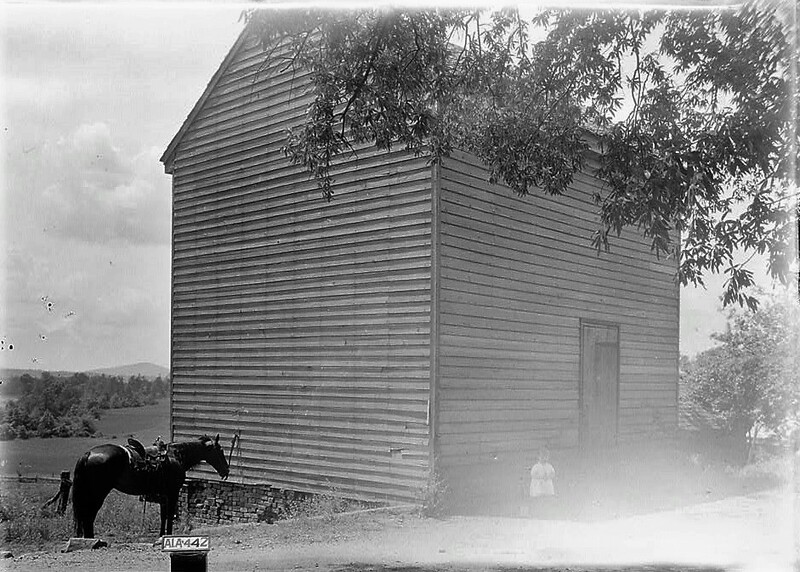 A gin house and carriage house still stand, put now to other uses, but the old brick spinning room is gone. 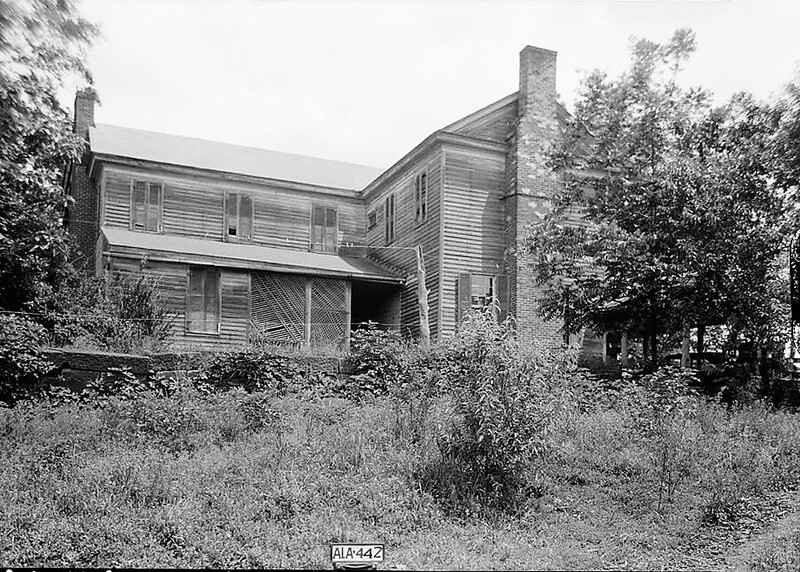 A saw mill, grist mill and flour mill were also operated by the owner, making the plantation a self-sustaining unit. On a hill, perhaps half a mile distant, but easily discerned from the house, is the brick-walled graveyard where the builder of Mt. Ida and a few members of his family rest. It is a peaceful place, with boxwood and crepe myrtle adding their perfume and delicate pink color. Mt. 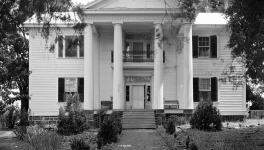 Ida has passed out of the hands of the Reynolds family; (“) the furniture has been divided among the children, or sold, and tho’ I love to go there to see the stately old house, I leave with a feeling of sadness that it must be so, and wish that it might have been otherwise. Present Owner: I. R. Baird. Previous Owners: Mrs. Mamie Flurnoy. 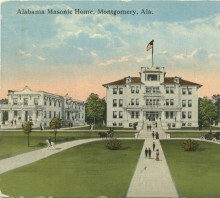 From 1890 to 1922. Mrs. Walker Reynolds. 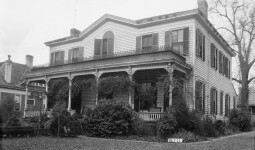 From 1879 to 1890. Walker Reynolds. From 1833 to 1879. Present Condition: Good state of preservation. 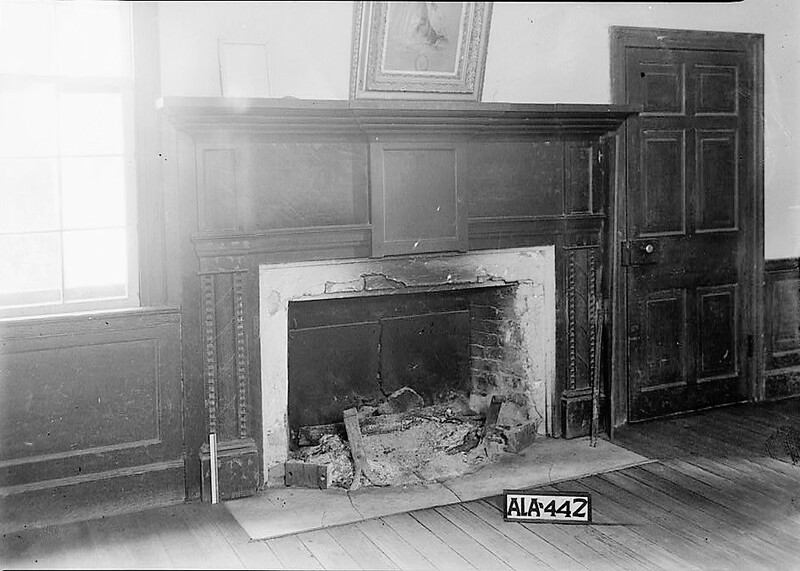 The original house consisted of six rooms and two halls; Later there was an addition of four rooms and two halls. 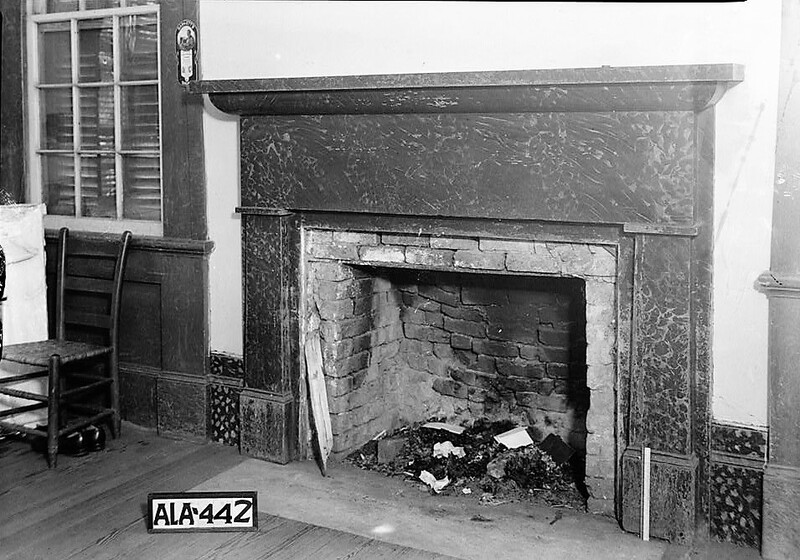 The old kitchen is connected to the house by means of a covered porch. 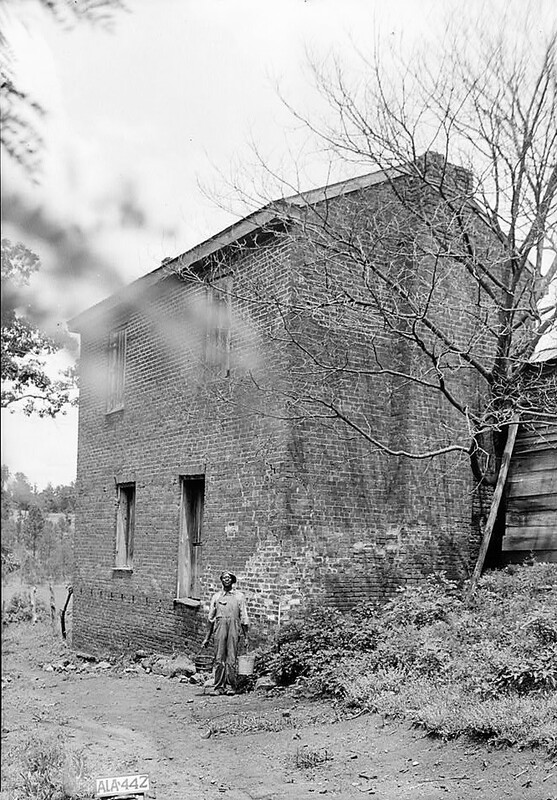 Materials of Construction: Frame house with a solid brick foundation, composition shingle roof. 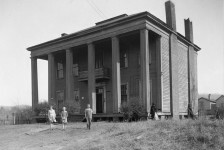 It has six round fluted columns, with inverted bell shape caps, the base of the columns and the front steps are of marble slabs. There is a balcony which extends across the front of the house, the iron railings used on this balcony were imported from England. ~he interior walls are plastered and papered. The floors are of a heart of pine flooring. It has five exterior chimneys. There are four French windows and a fanlight to each front floor. 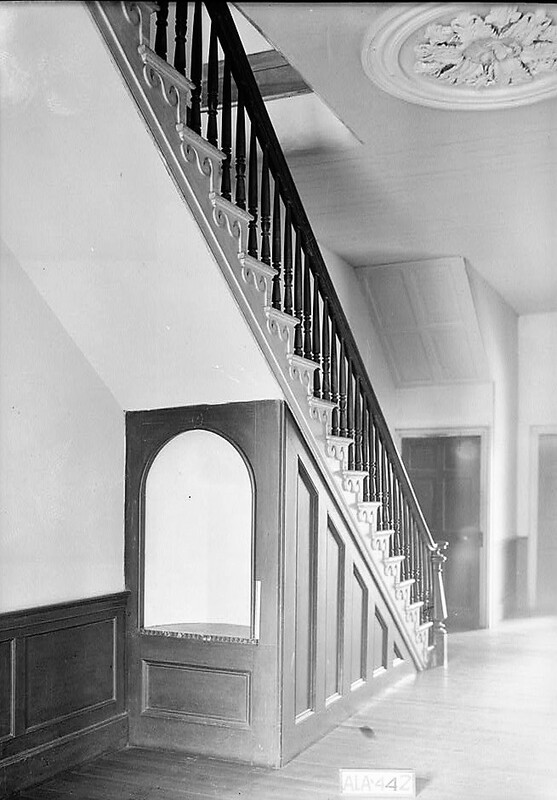 The transoms to each door contains twelve cut glass panes, which are reputed to have cost thirty five dollars each. 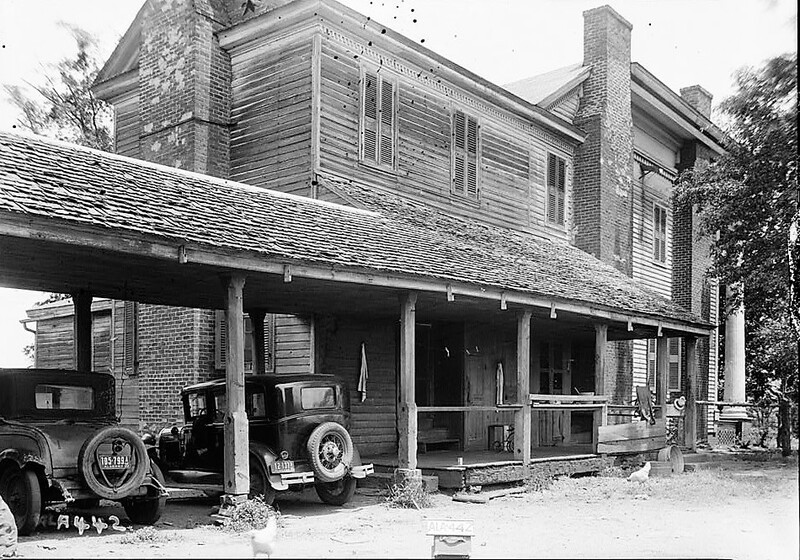 The wooden material used in the construction of this building was selected and prepared by the slaves. 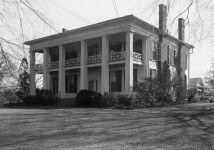 The marble used was also quarried from this plantation. 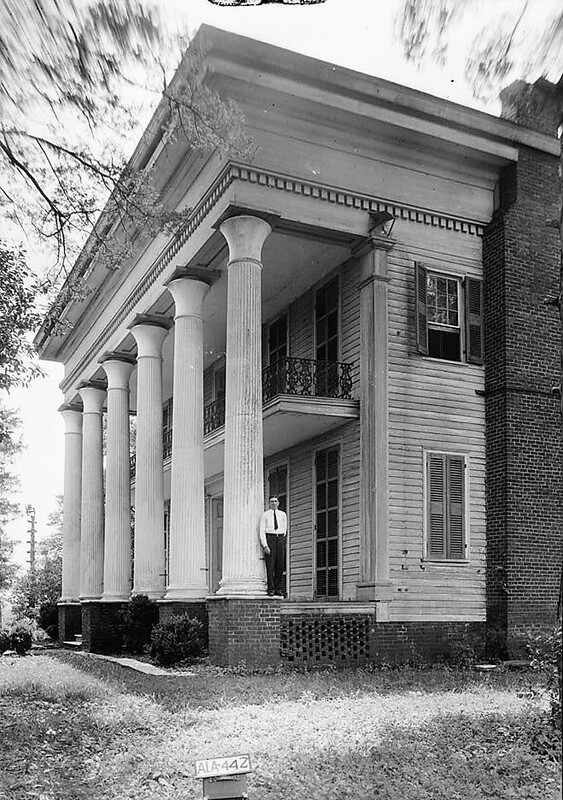 Mr. Walker Reynolds owned thirteen thousand acres of land, and three or four hundred slaves. He operated a saw mill by water power, a gin by horse power, also a spinning room, where the clothes, used by the slaves were made. 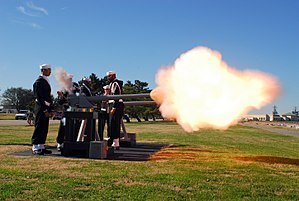 He manufactured the iron used on his plantation. 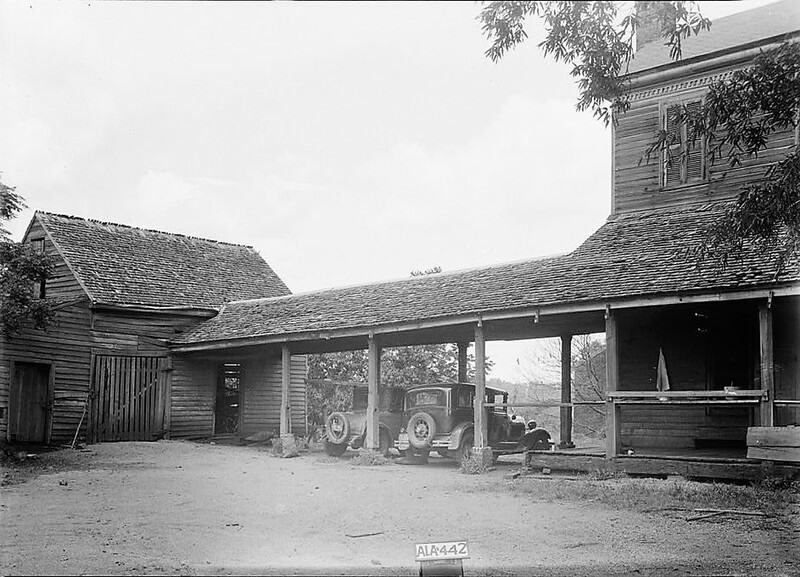 The following outhouses remain intact, and in good condition; the chicken house, milk house, bath, gin, smoke the carriage house, the old kitchen, and servants quarters.